Although I've been busy preparing for Halloween parties and a baby shower, the Indian festival of "Diwali" is also coming up soon and I've also been scouring the web for ideas for our family's celebration this year. 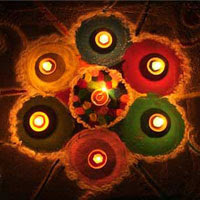 Diwali is the festival of lights. 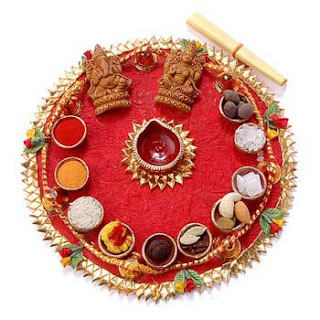 The most common traditional decorations for Diwali consist of "Diyas" (candles/lamps), "Rangolis" (intricate floral designs drawn on the ground with colored powder, rice and grains), "Torans" (banners), decorated puja thalis (the plate used in prayer ceremonies) and lots of fresh flowers. 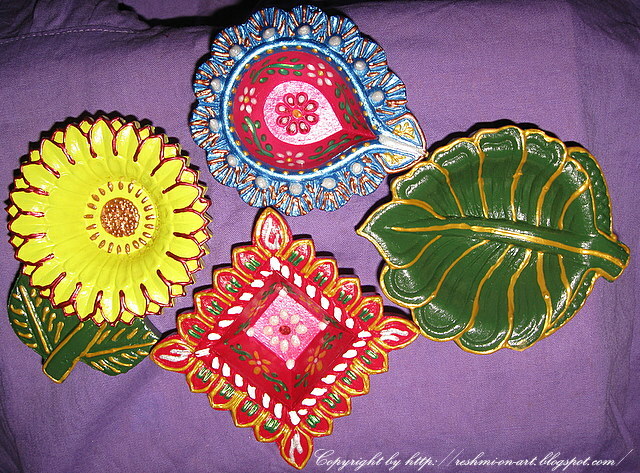 Check out these amazing diyas from http://reshmi-on-art.blogspot.com/2009/10/making-colourful-diwali-diya-designs.html. Diyas are small clay pots, decorated with vivid colors and designs. 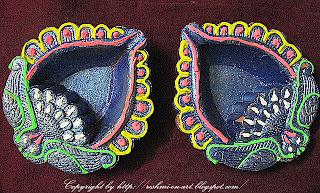 They are filled with oil and a home-made wick, which is lit, to create a candle-like effect. 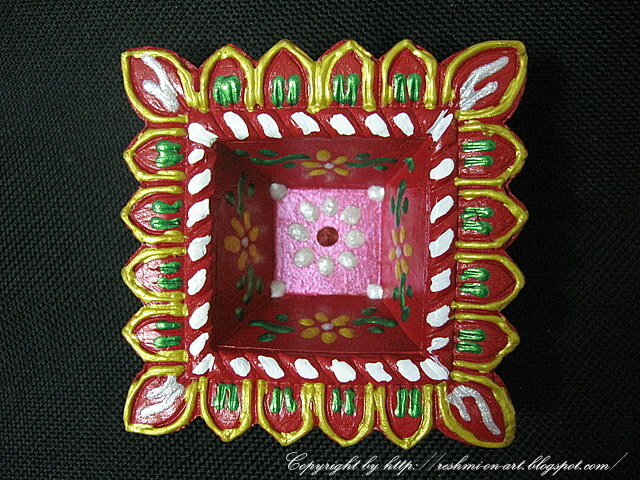 Reshmi, you are very talented! Here is a very traditional rangoli design from http://festivals.iloveindia.com/diwali/diwali-rangoli.html. 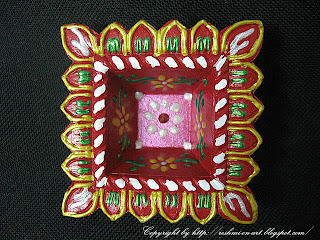 This rangoli from http://diwali-celebrations.blogspot.com/2009/09/floral-rangoli-for-diwali-rangoli.html is made of fresh flower petals. 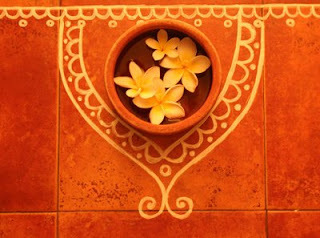 I absolutely love the effect (and fragrance!) this creates. 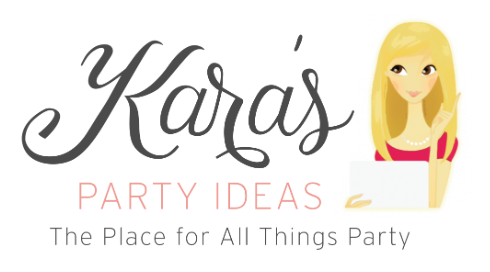 It's also far less messy than colored powder, which is a huge bonus if you've got small children "helping" you! 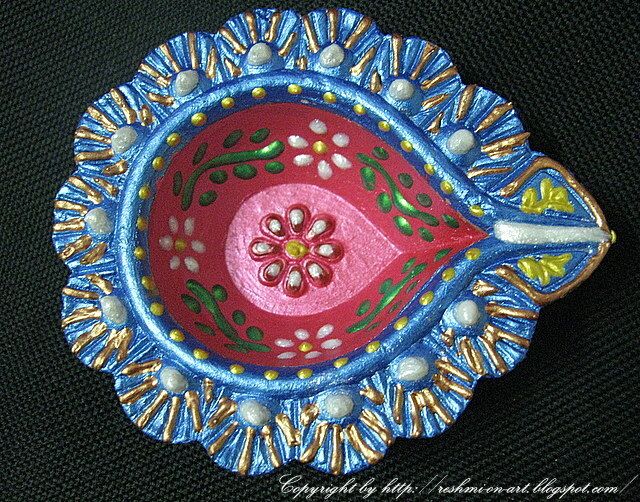 This design from http://www.theholidayspot.com/diwali/home_decorations.htm combines rangoli and diya elements. 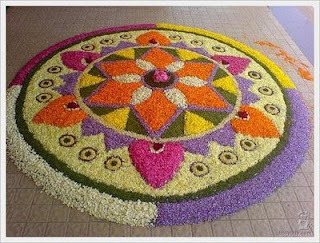 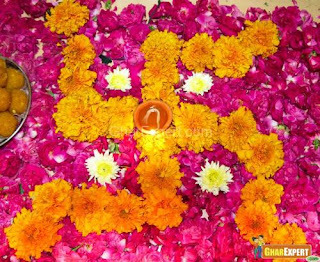 Here is another rangoli created with flowers from http://www.gharexpert.com/. 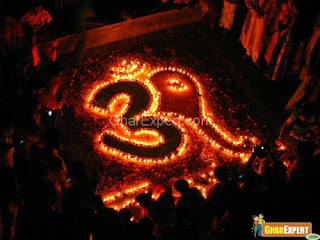 ﻿This idea, also from http://www.gharexpert.com/, utilizes diyas to create a giant "Om" symbol. 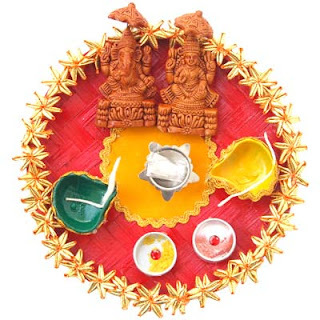 The website http://www.bharat9.com/ featured this puja thali, and also contains several "how-tos" on how to decorate your own. 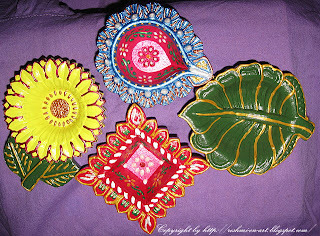 A simple and charming thali design from http://ilesh-myworld.blogspot.com/2008/10/diwali-pooja-thali-decoration-ideas.html, also with a "how-to". 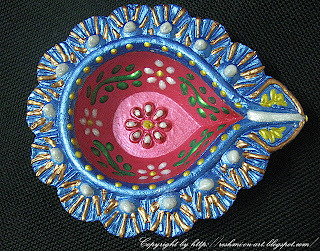 The blog http://diwali-day.blogspot.com/2009/09/diwali-puja-gifts.html has several more examples of thalis such as this. Smita! These are lovely ideas, I'm going to try some this weekend when I go home to visit my family in Houston. 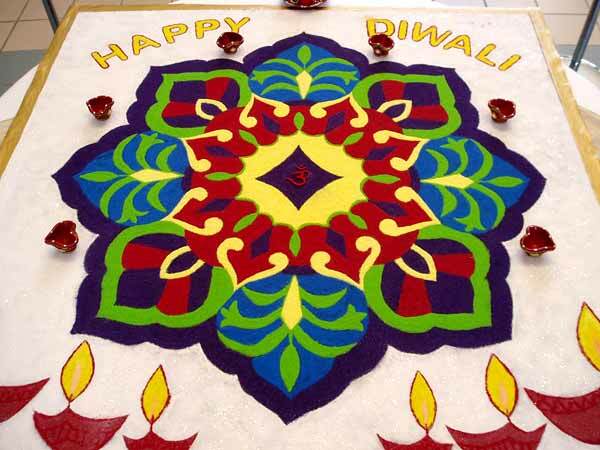 Happy Diwali and Sal Mubarak! 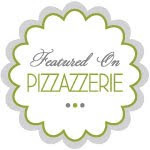 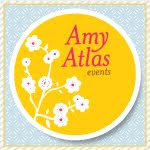 Farm Party featured by Catch My Party!! 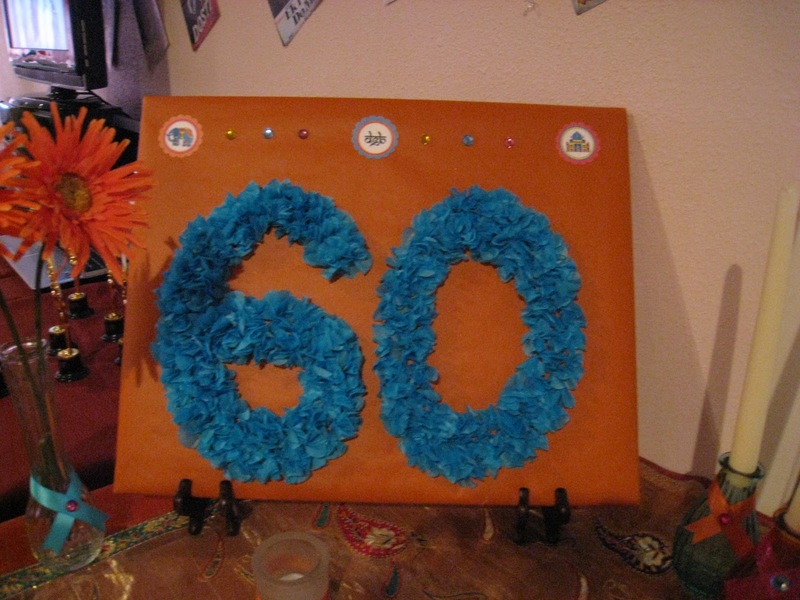 Halloween at Target hits the spot! 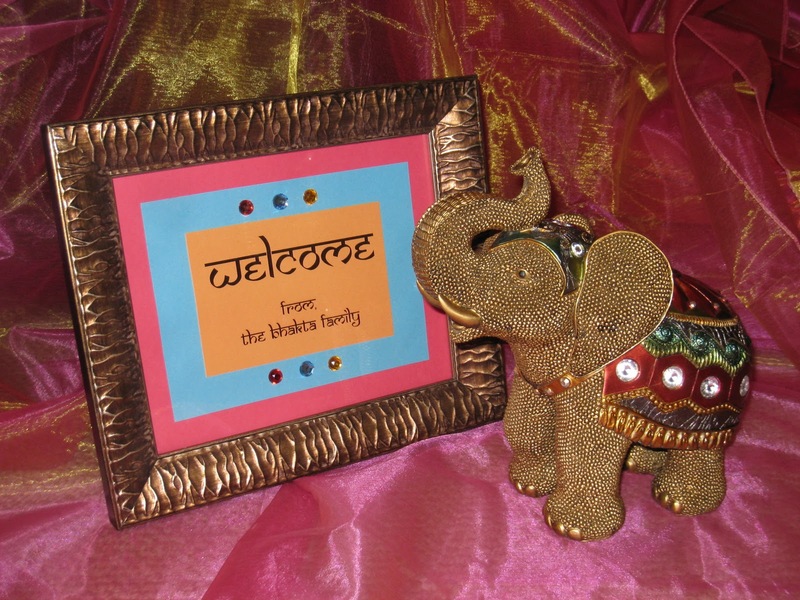 Bollywood Karaoke Party featured by Birdcrafts!